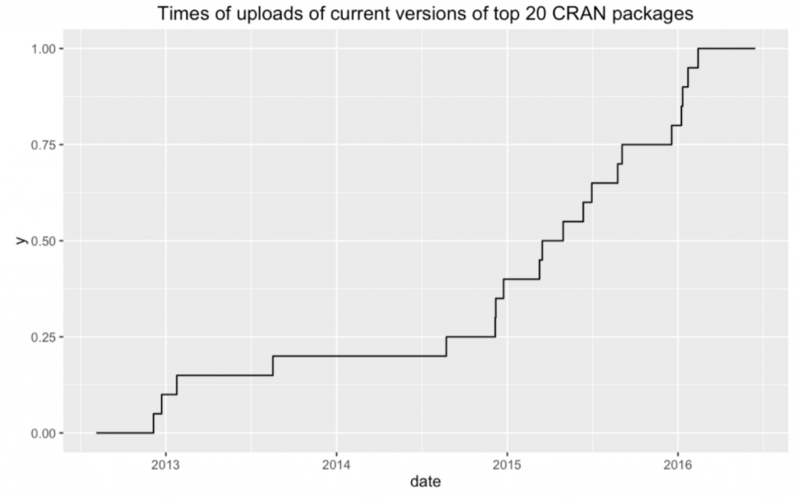 How many of current versions of selected packages were on CRAN 12 months ago? The ecdf for dates of current releases. Around 50% of these packages were updated in last 12 months. 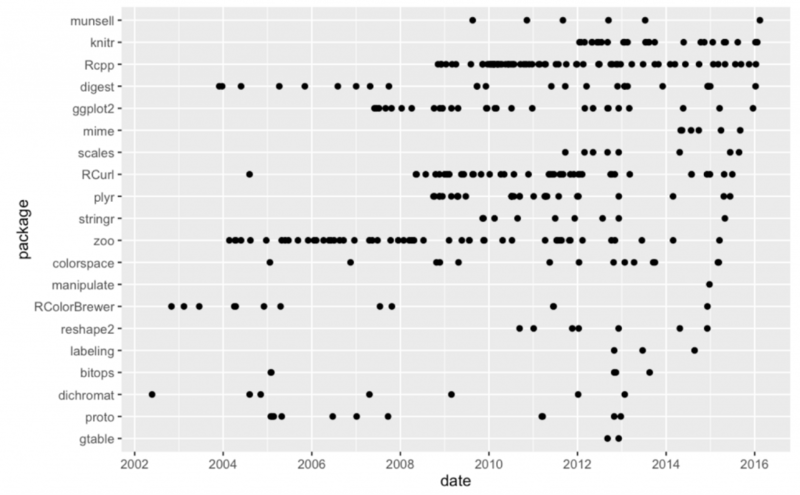 And sometimes these changes have a huge impact, like version 2.0 of ggplot2. In order to recreate the exactly same results you either need to keep copy of important (all?) packages or keep copy of obtained results. With current version of archivist (2.0) you can easily (just with one line) archive all created objects and embed hooks to these objects into your report. It’s enough to use addHooksToPrint() function at the beginning of your knitr script. to reproduce or retrieve all results presented here. The another solution is to keep the copies of package versions used by a project thanks to packrat package (snapshot(), restore()). Thanks! These are great tools and in 99% of cases they will be sufficient for reproducibility (the 1% is related to system and system libraries, some packages are working on windows not of osx or vice verse, maybe input data are very very large or you need some specialized hardware e.g .GPU). And it is much better to have R source code because it is easier to understand how objects were created. But they do not allow for easy access to objects that are already calculated and presented in the report. So it’s slightly different use case. Here you can immediately reach for objects that are presented, and you have API to search in the repository for objects that you are looking for. And you may check versions of packages that were attached at the moment of backuping. I’d like to add checkpoint. packrat is extremely slow if the project is on a network share and at least in my case seems to commit suicide after a few weeks (i.e. I have to rebuild the package cache every single time I open the project). checkpoint has fewer features but also less stuff that can go wrong.